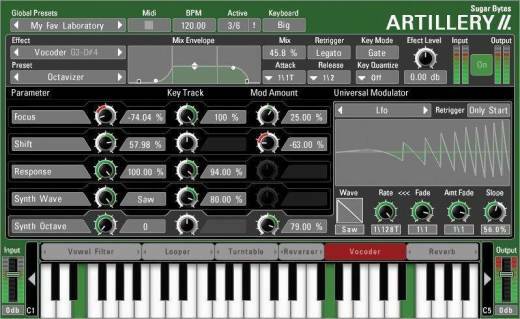 Artillery 2 now provides 28 innovative effects and unlimited creative possibilities: turn an EQ into a multi-band comp with a set of envelope followers, let a looper scratch its buffer using a step-sequencer, play pitched delay times on the keyboard, or let ring modulators pitches jam along the transients of your audio signals. Even a Vocoder with internal synthesizer is included. Use Artillery 2 to do magic with your tracks or live signals on stage, in your VST/AU/RTAS compatible DJ software or in your studio setup. Artillery is now available as version 2.3 and supports all 64-bit systems. In addition to that, Artillery now comes as a standalone application that turns your computer into an effect keyboard. Use it anywhere you want without the need of a VST/AU/RTAS compatible sequencer. The standalone also provides some useful features like the audio player and recorder. With the new "Check for Updates" function all Sugar Bytes products are up to date with just one click. Artillery is a multi effect. Effects are assigned to keyboard zones and enabled with MIDI notes. Universal Modulator: Each effect parameter has its own modulation engine containing LFO, Envelope, Envelope Follower and Step Sequencer. Key Track: The note position inside the effect zone can control parameters. Mix Envelope: Each effect has an envelope for Dry/Wet Control. Artillery II received the "Innovation-Award" by Computer Music.